Sweet and delicious, with a hint of cinnamon spice, like apple pie in a bottle! Love this wine with…cozy autumn evenings! From Stephanie Burkhalter of Wichita Falls, Texas on 1/29/2019 . 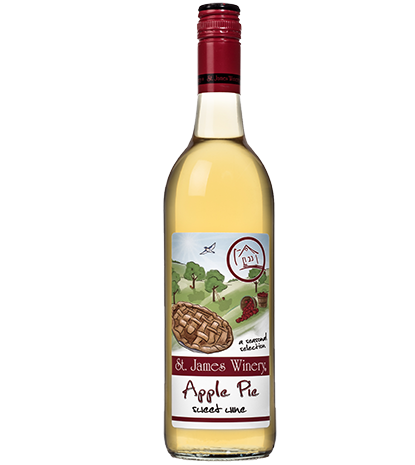 The Apple Pie wine is by far my favorite wine! I have not had a wine from St. James Winery that wasn't amazing but the apple pie takes first prize! I live in Texas and it isn't sold in stores so I have it shipped to my door. Shipping is fast and everything is well packed. Thank you St. James Winery! From Pam Adams of Eldersburg, Maryland on 10/2/2018 . The price of this product varies with the quantity of products ordered in the category "Wine"